wait...that's not a baby carriage! Historically in the U.S., the image of parents with babies has evoked scenes with them pushing baby in a stroller surrounded with bottle and pacifier icons. But in response to more recent research about attachment needs of infants, babywearing has become less of a fad confined to crunchy hippies and more of a respected practice of intelligent and intuitive parents. Babywearing isn't new. From the beginning of time, parents have utilized a variety of carriers and techniques to keep their baby close and safe. Only after the advent of modern contraptions like strollers and car seats did researchers begin to take interest in attachment patterns in infants and children. From the early 50's with John Bowlby's research on maternal deprivation, to Dr. Sears more recent coining of the term Attachment Parenting, history has seen an increase of attention to the developmental needs of babies. Besides the scientific evidence which supports physical touch and encouraging bonding between parents and babies, more and more parents are finding that wearing their babies provides convenience for every day tasks as well as caring for their children. Always make sure baby can breathe. Your baby's face should never be covered to the degree that he or she cannot get adequate access to air. Neither should he be in a position where his airways are constricted because his face is pressed inward toward your body or curled up on himself. Never run, bounce, jerk, jump on a trampoline or engage in activities that would compromise your baby's immature neck muscles. Think of it like whiplash. Your baby's neck should always be supported by you or the carrier, and should still be treated carefully even once she can hold her head up independently. Never wear your baby in a moving vehicle. When traveling, your baby should always be in a secure car seat with approved restraints. Use appropriate carriers for your child's age and weight (described below). Make sure your baby sling or carrier is "up to code" so to speak. Fabric should not be worn to the point of ripping, rings on ring slings should be specifically designed for babywearing, and wraps and backpacks should be secure enough not to stretch or slide allowing baby to fall out. Use common knowledge. While being hands free is a benefit of babywearing, it doesn't mean you will never make a mistake and not adjust your sling properly, or that your baby might be extra squirmy one day. Always be prepared to support your baby's neck, readjust a mal-positioned baby, catch your baby if she's falling out of the sling or care for your baby in any other way she might need. Make sure to use correct babywearing positioning and choose quality carriers (below) that encourage developmentally appropriate alignment of head, neck and hips. Baby's legs should be in a frog position, not dangling. Your baby's head should also be "close enough to kiss" if wearing on your front, which means baby should be high on your chest, rather than swaying near your waist. Ring Slings - One long piece of fabric that folds back in on itself with the use of two rings, creating a seat or pouch for baby. 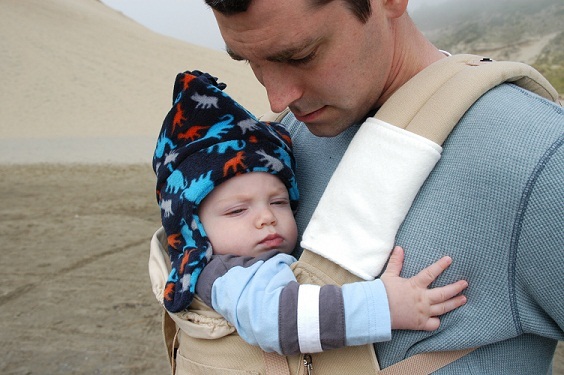 Ring slings are worn over one shoulder and are completely adjustable, can hold baby in a variety of positions and can double as nursing covers. Newborns can be carried in ring slings, but wearer should be careful that neck is well supported and hips are protected as described above. Ring slings can be used through toddlerhood or until your child is too heavy for them to be worn comfortably. Pouches - One piece of fabric sewn together to form a tube-like shape by folding back on itself and is worn over one shoulder. Pouches MUST be specifically fitted to your shirt size but preferably to your exact measurements. Pouches can be used for newborns up to early toddlerhood, but in my experience they are best for newborns. This type of carrier is most commonly worn incorrectly, with fabric way too loose and baby swaying and shifting at waist level (which is far too low and unsafe). If you have to use your hands to keep baby in place, pouch doesn't fit right or just isn't the right carrier for you. It is also very easy for airflow to be restricted for infants in the cradle hold, mostly because it can be so difficult to get the size and fit right on pouches. Mei Tais - One rectangular piece of fabric with four straps that go around waist and over both shoulders. This type of carrier is not ideal for newborns, as baby can get lost in the fabric and should be able to hold his head up independently. Ideal for older babies and toddlers, even heavier ones since weight is supported over both shoulders. Baby can be worn on front or back, and some carriers can even readjust to simulate a pouch or ring sling. Wraps - One very long piece of fabric, usually somewhat stretchy, that is wrapped around mom and baby several times, creating a very secure hold as if it were truly a piece of clothing. Wraps can be used for babies of any age. Some wraps are not ideal for heavier babies or toddlers because they are so stretchy and won't hold as tightly. For some, they can feel cumbersome with so much fabric or constricting or hot since they cover so much of the wearer. However, they are very versatile and are the best bet for breastfeeding hands-free and sleeping babies. Buckle Carriers - These can be pouch, sling, mei tai (Ergos are great) and doesn't allow baby's legs to dangle (Baby Bjorn and others are not ideal). Also make sure if it is a pouch/ring sling style that you can get it tight enough that baby is secure and flush with your chest, rather than swinging or swaying near your hips or waist. If you cannot tighten your buckle carrier tight enough to be secure, consider a ring sling, wrap or mei tai so you can get a proper and safe fit. If you're interested in trying out babywearing for the first time or need some new gear, check out my products!